Fiona Thomson-Carter is a Scottish microbiologist. After post-doctoral research in medical microbiology, she was the clinical scientist at the Scottish Reference Laboratory for Campylobacter and E. coli from 1992-2001. During the 1990s Scotland experienced major outbreaks of E.coli O157 infection, which attracted significant media attention and resulted in legal actions. Following these events, Fiona was able to contribute knowledge gained from the Scottish experience to several EU-funded initiatives. In 2001, she emigrated to New Zealand with her family to take up a science management role with a Crown Research Institute, a government-owned agency performing public health and forensic science. While working in New Zealand, Fiona has been able to broaden her experience by being involved in the science sector there, beyond her immediate role. Living in the Highlands of Scotland, I was always impressed by the “can do” attitude of Kiwi back-packers who jumped on planes to travel 12,000 miles to the UK. Having met NZ microbiologists at international conferences and hearing the quality of their science, when an opportunity presented itself, I decided to make the move even though I had never been to NZ. In 2000, with my previous role ending NZ seemed an attractive proposition. The Crown Research Institute, ESR (Institute for Environmental Science and Research) with which I had secured a science management role made everything really easy, paying for our family’s relocation – flights and household contents. The biggest challenge was convincing our daughters, then aged 10 and 6, that we were going to NZ long-term and not just for a holiday. Our journey to Wellington went well and we were greeted by colleagues and put up in accommodation for a few weeks until we found a rented property (our furniture transported by sea, arrived a few weeks after we did.) Everything that could be done to make us feel welcome was done. Kiwis are naturally friendly and hospitable. I did do some prior research on living in New Zealand, there are useful materials available including the NZ Immigration Service website. New Zealand has a real appetite to attract talented people and tries to facilitate their arrival. My future employers had applied for a talent visa for my husband (also a scientist) and myself. These were fast-tracked as science among others, is a preferred profession. After initial entry to NZ, we had to obtain subsequent working visas and ultimately, permanent resident’s visas. Becoming NZ citizens is still an option for us. The process is necessarily bureaucratic but it has been simplified and every effort is made to ease entry of science talent to NZ. We explored Wellington, the capital of New Zealand, which has a vibrant café culture – great coffee and food, museums and art galleries. Wellington is a compact city, built around a spectacular water-front with views of mountains and sea. The deep-water harbour is a major recreational area for rowers, sailors and passing wildlife such as orcas. Nowhere is more than 20 minutes from a beach and it is also easy to reach unspoiled rural environments. Our priority was to find a good school for our daughters, which was easy; high-quality education is readily accessible in the public school (state school) system. We began house-hunting, which is quite a mission. It seems no two houses in Wellington are the same, they are quite individual going from old “colonial” wooden cottages and villas to glass-and-chrome architectural statements. We received a lot of advice and support from the relocation agent brought in by our new employer to help us. We learned our first few words of Te Reo; Maori are the original settlers of NZ and the Treaty of Waitangi between Maori and the then-government is the founding document of NZ. 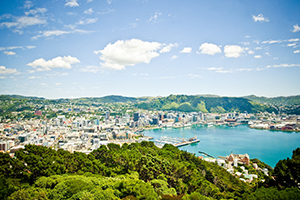 There is no language barrier in NZ for English speakers, historical links with the UK remain – driving on the left for instance, however, Wellington is a cosmopolitan city. Initially I was responsible for a group of 50 microbiologists and virologists performing national surveillance of important infectious diseases. It was a full-time role, 40 hours being the standard working week here. In relatively senior managerial roles there is an expectation that extra hours will be worked, not unusual for public health activities anywhere e.g. emergency responses. In my subsequent role as a General Manager reporting to the Chief Executive, I managed a group of 160 scientists engaged in public and environmental health science – microbiology/virology, molecular biology, epidemiology, food and water quality and safety and radiation science. The very nature of our science meant that responses to crises had to be prioritised so flexibility is required. The scope of the science practiced allows opportunities to become more generalist than specialist, quite usual in NZ. In addition to applied science delivery, I was also able to become involved in associated research projects. Building external relationships with clients, stakeholders and the broader science sector were also critical. How did you find the science sector in New Zealand? The science sector in New Zealand broadly comprises universities, Crown Research Institutes and private research institutes. There are world-class research facilities and teaching available. Unsurprisingly, given the importance of the primary sector to the economy there has been a strong focus on agriscience however, there is also an emphasis on wider innovation and smart technologies. Scientists here are highly collaborative and have extensive individual and organizational networks globally, which helps to mitigate risks associated with NZ’s comparative geographic isolation. Many international scientists choose to come here to work. Science is much higher on the public agenda in New Zealand compared with the UK. The Crown Research Institutes deliver to their sectors e.g. agriculture, marine, forestry to name only a few but within a unique construct: delivery of applied science and research in a commercially-sustainable environment. Over the last few years a number of national science challenges have been identified as areas of major focus for NZ science in the next 10 years. In common with the UK, bids for research funding outstrip the funds available. Extensive peer review processes are in place to ensure equitable allocation of funding. Universities can be comparatively large with more than 10,000 students who, in addition to their studies, become involved in community and sports activities. How does the New Zealand science sector differ from the UK and the EU? New Zealand universities’ curricula, research and organisational structures are comparable with UK and EU universities. The major difference, as outlined above, is in the role and mandate of the government-owned Crown Research Institutes, which employ most scientists in NZ. There are particular areas of research important to NZ for example, geology, seismology, agri- and horticultural science and environmental science. There are several independent research institutes, which are leaders in their respective fields. 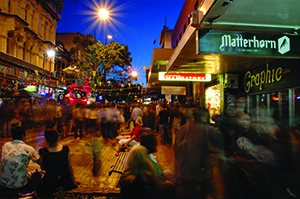 Wellington has numerous restaurants, cafes and bars. The arts scene is dynamic with festivals and exhibitions throughout the year. A significant contributor to NZ social life is the ability to play or be involved with a huge range of sporting and outdoor activities. Participation in sport is actively encouraged from schooldays onwards and the majority of Kiwis play, coach and/or umpire some form of social sport or outdoor activity. 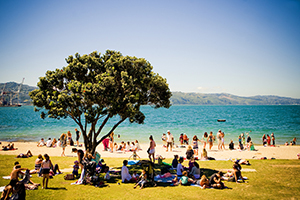 New Zealand with its temperate climate, even in Wellington, which has a reputation for being windy, offers an attractive lifestyle beyond the working environment. I am simply able to spend more time out-of-doors at the weekends and in holidays, than I could in Scotland. Equestrian sport is a family passion and it is much easier to own and manage horses here. Even usual family living can be outdoors more in the summer months. NZ scores highly in international standards of trustworthiness and lack of corruption and that is apparent in the welcoming and hospitable attitudes of Kiwis coupled with the desire to do the right thing. 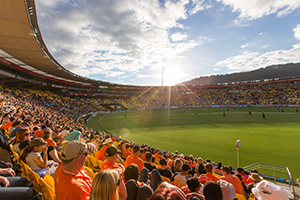 NZ punches above its weight in regard to sporting achievements and it is a particular thrill to be able to go to the local stadium and watch the All Blacks take on international rugby teams. We were made very welcome by colleagues and the local community and adapted quickly. The biggest challenge is really in the distance away from family and friends in the UK, although we do host a regular flow of visitors coming to NZ for holidays or work. In making the move from the laboratory to general science management, I have been able to acquire a lot of new knowledge and expertise and to be effective at a senior level. Many different opportunities have been made available to me throughout the science sector and in working closely with clients and stakeholders who need scientific input. The NZ hierarchy is flatter than the UK’s and it is more likely that scientists will have direct interactions with government Ministers and their senior officials. This helps to highlight and endorse the relevance of the science performed. I have developed a much greater skill-set than I would have been able to in Scotland. Be prepared to be collegial and collaborative. NZ science operates in a co-operative environment and sharing of knowledge and joint objectives are important. NZ has a small population, less than five million, the universities and other research institutes are generally located in or near, the larger cities. There may be fewer opportunities in the purely rural areas. Last but not least, NZ recognizes Maori as the original settlers and the special relationship Maori have with the natural environment. Accordingly, Maori values and priorities must be incorporated and appropriately addressed in all areas of research. Dr. Fiona Thomson-Carter is a Scottish microbiologist who has worked in New Zealand since 2001. So far, her career has traversed medical microbiology, research, applied science and science management. She is continually passionate about bacteria and their evolution. More broadly, she is focused on the positive difference science and scientific thinking, can make in our everyday lives. Living in New Zealand has allowed her to expand her experience and become involved in areas well beyond her immediate scientific discipline, which has been very rewarding. She would like to aid other scientists, whatever their discipline, in discovering what can be achieved in New Zealand.